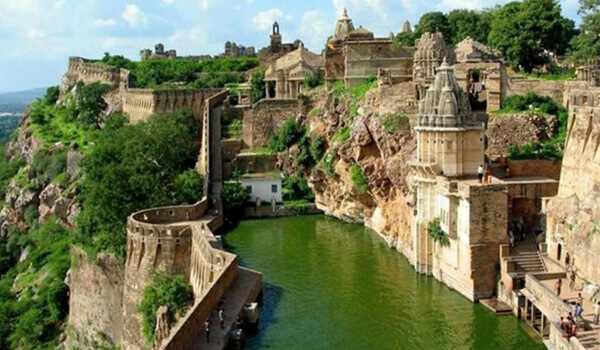 The Chittor Fort is the capital of Mewar situated in Chittorgarh town of Rajasthan state, is one of the largest fort in India. It is registered in the UNESCO World Heritage Site. It covers an area of 691.9 acres and spread over a hill of 590.6ft in height. It featured with massive seven gates, historical palaces, Jain temples, Hindu Temples, gardens, two renowned commemorate tower and water bodies. It is regarded as the symbol of Heroism, pride and passion of Rajputs. History: It was built by the Maurya Rulers in the 7th century was the capital of Mewar. The fort was attacked three times and it was saved by bravery of Rajputs every time. Firstly it was attacked in the year 1303 by Allaudin Khilji, Sultan of Delhi, who has the great desire to want Beautiful Rani Padmini. Then the second time it was attacked in the year 1535 by Bahadur Shah, Sultan of Gujrat. Lastly, Third time it was attacked by the Mughal Emperor Akbar for siege the Chittor Fort and conquer Maharana Udai Singh. By seeing all the three attacks Jauhar was committed by both the men and women folks. 1.Vijaya Stambh: It is also called the tower of victory. It is a 9-storyed tower was built by Maharana Kumbha to celebrate his victory over Mohamed Khilji. It gives the awesome view of the whole town from the top of the Tower. 2. Kirti Stambh: It is also called the Tower of Fame. It was dedicated to 1st Jain Tirthankar, Lord Adinath Ji. It is 22m in height and a narrow stairway of seven stories tower built by a Jain merchant in the 12th century. 3. Gaumukh Reservoir: It is a deep tank filled from the water coming from the ‘cow mouth’ and here you can also take a holy dip and feed the fishes. 4. Rana Kumbha Palace: It is one of the great monument of this fort. It is believed that it is the place where Rani Padmini and other women committed ‘Jauhar’. 5. Padmini Palace: It is a wonderful structure situated on the bank of the lotus pool as it was built here for the safety of privacy of the women of the Royal Family. Allauddin Khilji, Sultan of Delhi saw the reflection of the Queen Padmini’s reflection and besotted by her beauty and attacked on the Fort to achieve the Queen. The another attractions of the Fort are the Jain Temples, Meera Temple, Raja Ratan Singh Palace, Fateh Prakash Temple, Kalika Mata Temple and Seven Gates etc. It is the one of the Best place to explore the Historical Forts. Grab the opportunity to take Tour Packages like Golden Triangle Tour Package, Rajasthan Tour Packages and Same Day Tour Packages with Car Rental Services and Private Car Driver according to your affordable budget with Real India Journey.